On Christmas Eve 1992, five young guys (Matt, Gugi, Chrigu, Rindli, P.J. ), who were part of the music scene in Bienne, formed a Ramones cover band called the Animal Boys. By doing so, they hoped to escape the seasonal, family ritual of turkey and all its trimmings. Since than they played endless gigs and became "theee" Ramones coverband. Some of the band members from X Offender from Büren an der Aare have their origin in the seventies Swisspunk scene. Like their band name is telling us, they play 77 Punk n Roll, but exist only since 1993. It's their third release in 25 years of existence. For todays standart rather unusal is, that their is with Jean Marmier (ex-Ventilators) a saxophon player part of the band...but that makes realy the difference. 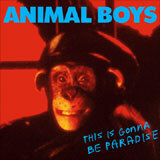 Animal Boys with "This Is Gonna Be Paradise"